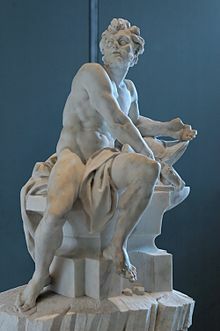 Hephaestus (/hɪˈfiːstəs/, /həˈfɛstəs/ or /hᵻˈfɛstəs/; aicht spellings; Auncient Greek: Ἥφαιστος Hēphaistos) is the Greek god o blacksmiths, craftsmen, airtisans, sculptors, metals, metallurgy, fire an volcanoes. Hephaestus' Roman equivalent is Vulcan. In Greek mythology, Hephaestus was the son of Zeus and Hera, the king an queen of the gods. In another version, he was Hera's parthenogenous bairn, rejected by his mother because of his deformity and thrown oot of heaven and down to earthd. As a smithin god, Hephaestus made aw the wappens o the gods in Olympus. He servit as the blacksmith o the gods, an wis worshippit in the manufacturing an industrial centers o Greece, pairticularly Athens. The cult o Hephaestus wis based in Lemnos. Hephaestus' seembols are a smith's hammer, anvil, an a pair o tongs. ↑ Graves, Robert (1955). The Greek Myths:1. Harmondsworth, Middlesex, ongland: Penguin Books. p. 51. This page wis last eeditit on 31 Mairch 2019, at 16:50.